watch, even if you don't like magical girls. the fact that she is able to get up from her wheelchair, makes sense in lore, but feels kinda cheap, espicily considering real disabled people can't really do that. One thing; THIS IS NOT MADOKA MAGICA. Madoka Magica is so absolutely awesome, but Yuki Yuna is awesome in its own way. Really awesome. Also, you aren't allowed to judge it until you finish it, all 12 episodes, all the way to the end. This is the best anime I've watched in the past 6 months. I see many mixed reviews, but this is definitely, hands down, amazing. The build-up is actually pretty slow, but it is a cute, cheery, happy slice-of-life story with tales of friendship and sisterly love and a teensy bit of action and drama when they sometimes have to fight. It is somewhat confusing to start off, but it gets clearer as you progress. I am not really a crybaby, but MAN OOOH MAN did I BAWL non-stop through the last episodes. Yes, I do realize I am making this out to be all cheery and happy, but that isn't fully the case. There is pain, suffering, realizations that make their whole world crumble and break, lost hope. The ending felt like the creators needed to make it lighter and more cheerful, which, in my opinion, actually worked. Now hold on, I'm not saying that 'Oh, it was so amazing since it ended on a happy note' or 'Oh, it was cute and cheery after all, I'm so glad'. I am saying that the end felt so fake, it made me cry more. Like the story doesn't actually get better, this version just says that it gets better. I know that doesn't sound like much, but I cried for 20 minutes straight after it finished and the ending song was playing. By the way, the music and artwork are really good as well. Anyways, this show is a ride of emotions and quite a tearjerker. (I haven't cried this much on any other show, not even close to it.) I highly, highly, HIGHLY suggest you watch this, it is exceptionally, extraordinarily, remarkably, immensely, intensely, unbelievably, stunningly, marvelous. Here are a few of my... 'other' thoughts on how Yuki Yuna is a Hero went. OH MY FLIPPING GOODNESS THIS SHOW IS SO AH I'M CRYING JUST WRITING THIS BUT THEY ARE SACRIFICING THEMSELVES AND NONE OF THE OTHER HUMANS KNOW IT AND IT HURTS THEM AND THEY WANT TO GIVE UP AND IT'S PROBABLY BETTER IF THEY GIVE UP BUT OH MY GOODNESS WHEN KARIN IS THERE AND DOESN'T ACTUALLY KNOW IF YUNA IS WITH HER CAUSE SHE CAN'T SEE OR HEAR AND YUNA IS CRYING AND WHEN TOGO WANTS TO KILL EVERYTHING AND IT'S PROBABLY A GOOD IDEA CAUSE NO ONE KNOWS WHAT THEY ARE ACTUALLY DOING AND THE HERO CLUB IS SAVING THE WORLD WHEN THEY DON'T HAVE TO AND IT JUST HURTS THEM AND AND AND OHHHHHH MYYYY I'M CAN BARELY SEE THE SCREEN THAT I'M TYPING ON RIGHT NOW THIS IS JUST... AHH THEY COULD JUST NOT DO ANYTHING THEY COULD LEAVE EVERYONE TO DIE THEY DON'T HAVE TO SUFFER THEY COULD GIVE UP BUT THEY DON'T THEY PERSEVERE WHICH ISN'T REALLY THE SAD PART WELL IT ACTUALLY IS SUPER SAD AND ALL OF IT IS SAD BUT LIKE THEY PUT EVERYONE ELSE, ALL THOSE STRANGERS FIRST. BEFORE THEM. THEY PUT RANDOM PEOPLES' HAPPINESS BEFORE THEIRS BUT THEY DON'T HAVE TO. BUT THEY DO. AND THE RANDOM PEOPLE THINK EVERYTHING IS NORMAL. I do feel, though, that if in the end, none of them got better, it would be more sad. However, there is that element of 'even though it's somewhat cheesy, they sorta get rewarded (in a sense) for their good deeds of killing the monsters' which is pretty sad in and of itself.. oh yeah, and when they realize they might not remember each other and they will just suffer alone, and when it shows that girl laying there, not being able to move, that is just so so so so so flip i'm crying again just a sec... ok i'm better sorta not really hold on.. there now it's.. i'm back from crying in the corner for 3 minutes anyways so this is so good but yeah oh goodness me oh my i can't do this anymore. sorry i'm just gonna end it here though i have so much more to talk about..
#85. Shintoism in modern day, a magical girl story. Yuuki Yuuna and friends all work together in their middle school club, the hero's club. Together they spread happiness and do their best at being everyday heroes. Soon though they become true heroes in the eyes of their society, when a mysterious app on their phone appears and embodies them with omnipotent powers of their savior deity, Shinju-sama, a collective of earthly gods. Told that their world is in imminent danger, they must stop the invasion of beings known as Vertexes, sent by the heavenly gods, or risk the extinction of humanity. 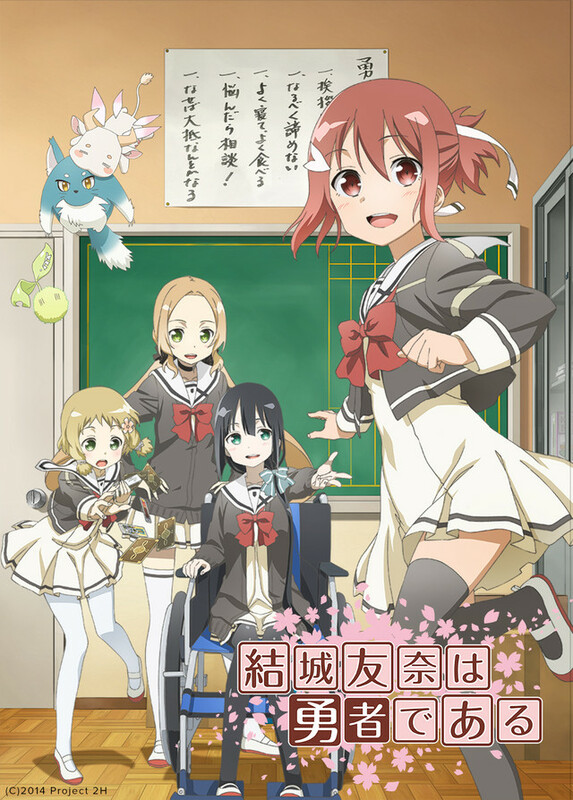 This was my first magical girl anime, and while there is the world renowned Madoka Magica series, I personally enjoyed the more light hearted side of Yuki Yuna more. That isn't to say this anime doesn't have it's fair share of challenges other than the hero clubs daily matters. All over the anime are themes and ideas of Shintoism, and giving for the great good, no matter how small or large the sacrifice may be. As long as it pleases the somewhat Tyrannical Shinju-sama, anything goes. Yuki Yuna is a Hero places it's characters both laid back fun, and terrifying hopelessness. It's a magical girl anime that I believe can stand up there with Madoka Magica, it might not be as cruel and despairing, but it's got enough heart and emotion to break free figuratively and literally. The prequel & sequel season while not available on Crunchyroll, is available over at Amazon Prime Video. This is a weird one. Even though it is clearly inspired by Puella Magi Madoka Magica, I feel Yuki Yuna is a Hero has an identity and personality all its own. I won's spoil it obviously, as the story near the end is one of the shining features of the show, but you end up feeling for these characters a lot more than you'd imagine, and seeing them struggle and work together makes the show special. The girls you meet along the way and their personalities (though tropes at times), along with the great music and atmosphere of their world really lays the foundation of a great story to be told, and in my opinion, it is. Take that with the intense action mixed with occasional lightheartedness, make this a must-see for fans of the magical girl genre, or those who just want an enthralling story with lovable characters. YUKI YUNA IS A "HERO? ": That's Up To You To Decide. I apologize in advance for what you are about to read but writing about this series without spoilers is especially difficult for me. Around summer, watching series is always harder for me. Not having much time to spend and regularly tuning in for two on going series lead to this review being late by a lot. To tackle the matter heads on, Yuki Yuna Is A Hero gave me mixed feelings. I found very unsettling the pace of the series generally. The concept was interesting enough for me and that’s how I took it on. Technically speaking, we have a beautifully executed series with nice visual and audio representation. The music was nice the effects were nice and the whole thing screamed high quality. The con with this kind of “recipe” is we tend to shout wanting to hide the truth. Same thing applies to this series. While it started on with a slice of life aspect totally disorienting me as to what was happening, things took of high time. In a heartbeat little girls are selected by unknown deities to become heroes. While the plot was good enough and the characters adorable, it missed the spice of reality. Especially concerning the consequences of the girls’ powers; I found it weird how the series ignored them for a good 3 episodes only to delve in the matter in the final episodes to elevate the drama. The ending was missing cohesion and was beyond understanding depending on what was shown before. It feels more like a “handbrake” to the series instead of a smooth halt. Really, Yuki Yuna Is A Hero, wasn’t a bad series. Hence the good rating I and many others gave it. I would classify it as “odd”. In more ways than one the series does things different from other similar series. While you watch it, it is easier to understand this. As a whole it felt fast and unsettling. Be sure to take a look and see for yourself. Overall really good show with an interesting plot. Its nice to see that there's a magical girl show where there are repercussions. That being said I would've liked it a bit more if Yuki Yuna had been less annoying...childish. There seemed to be a complete lack of regard for self care and a will to live in many of the characters. Also wasn't a fan of the fix it for girls with disabilities. 1) The characters actually get injuries. Of course "I got better", is what happens. 2) The "mascot" characters are, at best, ridiculous. At worst distracting, and typical in what they do. 3) This has, IMO, the worst monster design ever. EVER. Slice of life magical girl. I did love this anime a lot. I thought it was really well done, and how it was not really a 'dark magical girl' show, but it had the elements were nice. The first season was the best IMO, but I did like the Hero Chapters as well. The Washio Sumi Chapters were intense though. I know some people have issues with how it ended, but I think it was good - it was what I expected from this anime. That's why the Washio Sumi Chapters surprised me a bit! Now I'm not gonna say I am the all that good at finishing anime, mostly because I hate that hollow feeling you get at the end of it, and while yes I feel that about this anime too, the ending was superb. I've watched it 2 times now and will most likely watch it a third time when the second season is released for me to watch, but I'm not tired of it. I felt emotional both times a watched it and was possibly more invested the second time than the first. I was brought to tears by the sheer volume of emotions this shows final episode made me go through. Its super intense in its laying it on thick stuff. I would recommend this to those who are looking for characters to become attached to and to love and cherish and then bawl your eyes out at the ending because of the events that take place. Overall a great anime!